What Is the Real Value of $100 in Your State? 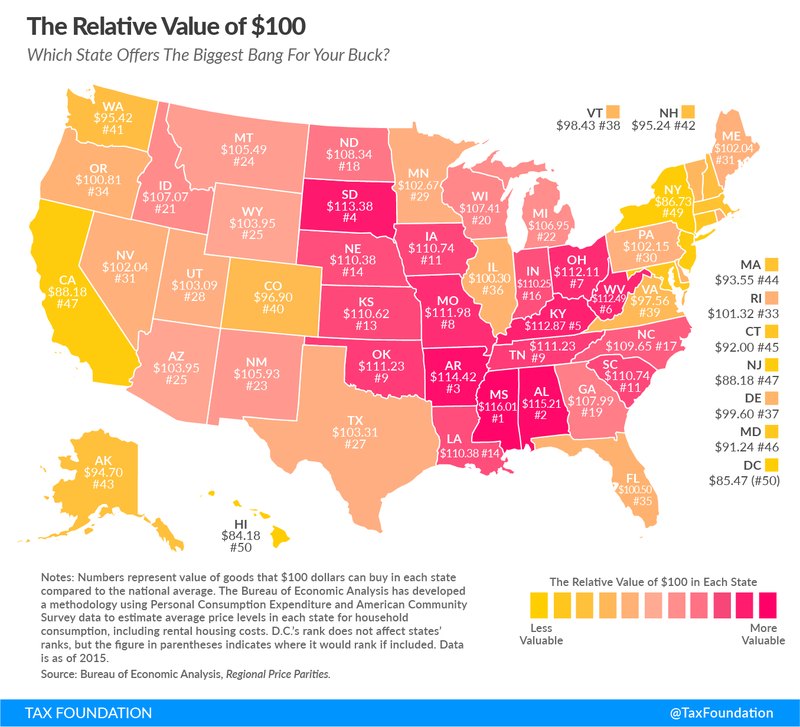 This map shows the real value of $100 in each state. Prices for the same goods are often much cheaper in states like Missouri or Ohio than they are in states like New York or California. As a result, the same amount of cash can buy you comparatively more in a low-price state than in a high-price state. 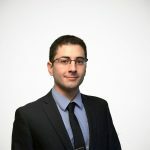 The Bureau of Economic Analysis has been measuring this phenomenon for two years now; it recently published its data for prices in 2015. Using this data, we have adjusted the value of $100 to show how much it buys you in each state. For example, Ohio is a low-price state. There, $100 will buy you goods that would cost $112.11 in a state at the national average price level. You could think of this as meaning that Ohioans are, for the purposes of day-to-day living, 12 percent richer than their incomes suggest. The states where $100 is worth the most are Mississippi ($116.01), Alabama ($115.21), Arkansas ($114.42), South Dakota ($113.38), and Kentucky ($112.87). In contrast, $100 is effectively worth the least in Hawaii ($84.18), the District of Columbia ($85.47), New York ($86.73), New Jersey ($88.18), and California ($88.18). See the table at the bottom of this post for a ranking of all 50 states. Regional price differences are strikingly large; real purchasing power is 36 percent greater in Mississippi than it is in the District of Columbia. In other words, by this measure, if you have $50,000 in after-tax income in Mississippi, you would need after-tax earnings of $68,000 in the District of Columbia just to afford the same overall standard of living. It’s generally the case that states with higher nominal incomes also have higher price levels. This is because in places with higher incomes, the prices of finite resources like land get bid up. (This is especially true in cities.) What is also true is that places with high costs of living pay higher salaries for the same jobs. This is what labor economists call a compensating differential; the higher pay is offered in order to make up for the low purchasing power. This relationship is important, although it does not always hold true. Some states, like North Dakota, have high incomes without high prices. Adjusting incomes for price level can substantially change our perceptions of which states are truly poor or rich. 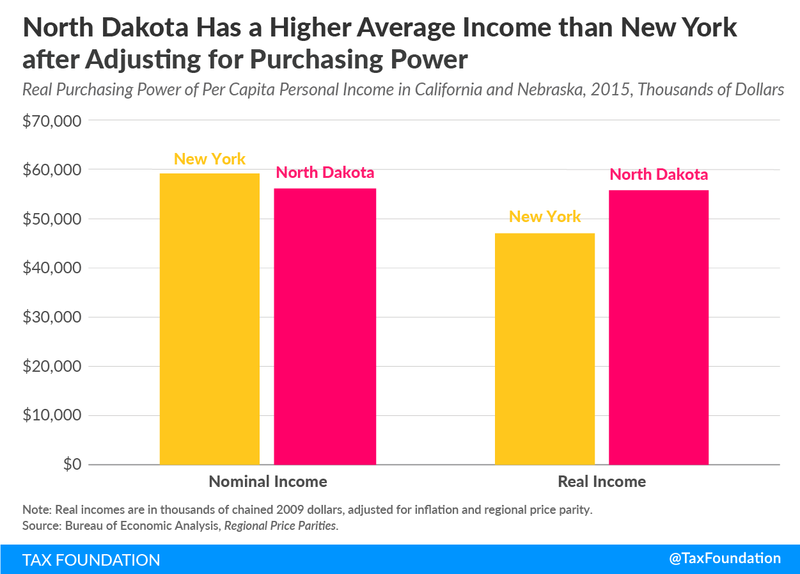 For example, New Yorkers and North Dakotans earn approximately the same amount in dollars per capita, but after adjusting for regional price parity, North Dakotan incomes can buy more. Many policies – like minimum wage, public benefits, and tax brackets – are denominated in dollars. But with different price levels in each state, the amounts aren’t equivalent in purchasing power. This has some unexpected consequences – people in high price-level states like New Jersey will often pay more in federal taxes without feeling particularly rich. Notes: D.C.’s rank does not affect states’ ranks, but the figure in parentheses indicates where it would rank if included. The U.S. all items RPP is the average price level across all states and D.C.
What is the Real Value of $100 in Metropolitan Areas?